I’m so excited to re-share this recipe that has been a HUGE favorite on the blog in the last few years! I think that people love it so much because of how intensely flavorful it is. Like every single element of the dish adds so much, and then it is all capped off with the most delicious zesty Spicy Lemon Cashew Dressing! We have an awesome healthy restaurant in our neighborhood called Bounty Kitchen and I grab healthy salads there all the time- this is a riff on one of my favorites that I often get there. I love that it is so filling and nutritious and is seriously the perfect lunch or dinner. You could make this and use it for two lunches, take it to work, or share with someone you love! 1 cup canned black beans, rinsed and drained. Preheat the oven to 400 degrees. Place the cashews in a glass and cover them with hot water- set aside to soak for 10-20 minutes. In a medium pot over medium heat bring the vegetable broth, cumin and salt to a simmer. Pour in the quinoa and whisk together. Bring the quinoa to a simmer and then put a lid on the pot, reduce the heat to low and let simmer for 20 minutes. Turn the heat off and let the quinoa sit in the pot with the lid on for another 15 minutes. Fluff with a fork and mix in the minced parsley and green onions. Season to taste with kosher salt. Toss the sweet potatoes with 2 tablespoons of oil, cinnamon and kosher salt and roast on a bare sheetpan for 17 minutes until golden brown and tender. Warm the beans in a small pan if desired and season to taste with kosher salt. Using a fork on a cutting board, sprinkle the avocado with salt and add the lime juice and the cilantro and smash everything together until well combined but still chunky. Assemble the bowls by dividing the quinoa between 2 bowls, and topping with half of the sweet potatoes and half of the black beans. Add greens and tomatoes to each of the bowls. Drain the cashews and add them to a blender with the garlic, red pepper flakes, olive oil, lemon juice and agave. Puree on high until smooth- season to taste with kosher salt. Drizzle the bowl with the dressing and add more as desired to taste. Now this is my kind of bowl! Want to make this ASAP! OMG I love quinoa salads, I’ll be definitely making this. Do you think I could substitute honey for the agave? Looks like the perfect meal! So much flavour! wow, so many great salads on the www right now and this should be at the top of the pile!! The dressing on top of this sounds amazing!! Am I totally lame that every time someone mentions Dim Sum I think of that one episode of Veronica Mars where she brings Dim Sum take out to her boyfriend’s house and he opens the door and she says, “Dim Sum…and then some?” haha. 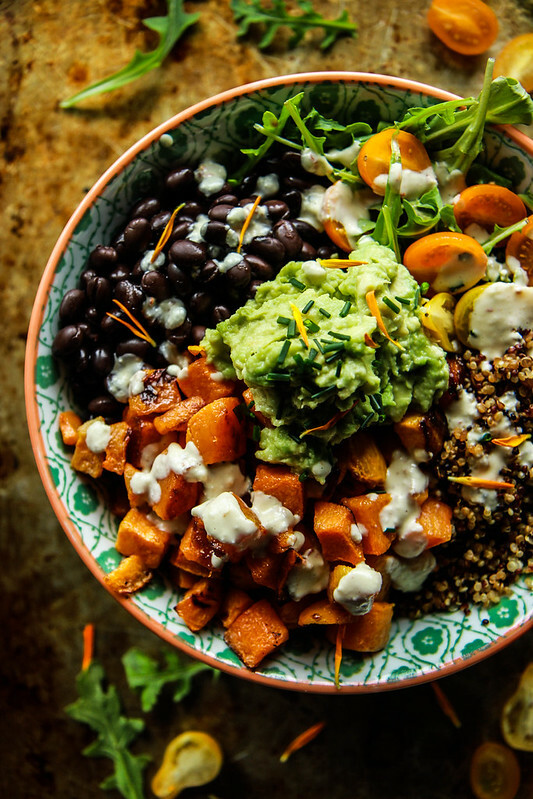 This quinoa bowl looks amazing and like the kind of thing I would eat way too much of!! Heather, thank you for this deliciousness! I had everything in my pantry but the cashews so I used some peanut butter in the dressing. It is all sooo good I will make it again next week! What a great idea Ruth! Thank you for the peanut butter inspiration! This was so freakin’ delicious!! OMG! I mixed the cashew dressing with arugula and spinach and then mixed that in with the quinoa. Put the homemade black beans (done in 1 hr. 40 mins w/no soaking) on one side and the sweet potato on other side with avocado on top. Wowza! Really amazing…can’t say enough good and yummy things about it! Thank you!! THIS IS SO PRETTY. Definitely a different spin from what I usually see of quinoa bowls so I plan to try this when I’m feeling patient with all those ingredients. Does anyone know the nutritional values? This looks delicious! Thanks for putting the recipe in the print format. This was absolutely delicious, but some of the amounts were way too much. One cup of uncooked quinoa makes like four cups, which is too much. I’d suggest cutting down the quinoa to 1/2 cup (and broth to 1.5 cups), as well as olive oil in the sweet potatoes from two to one. But otherwise this is definitely a keeper! I have made this twice now (in two weeks). It is seriously delicious. I used maple syrup in place of agave. It is packed with flavour and a very satisfying meal. Oh good MaryE!! So happy that you liked it!! I just made this tonight and it was AMAZING!! So glad you liked it Ashley!! I just made this and am eating it as I type and OMG. It’s. So. Good. I love that each topping is seasoned well and so flavorful. The cinnamon in the potato is just perfect. I’m going to be craving this one again. BTW, I didn’t have cashew so used some prepared tahini. Next time I’ll try to make it with the cashews! This is definitely a winner! 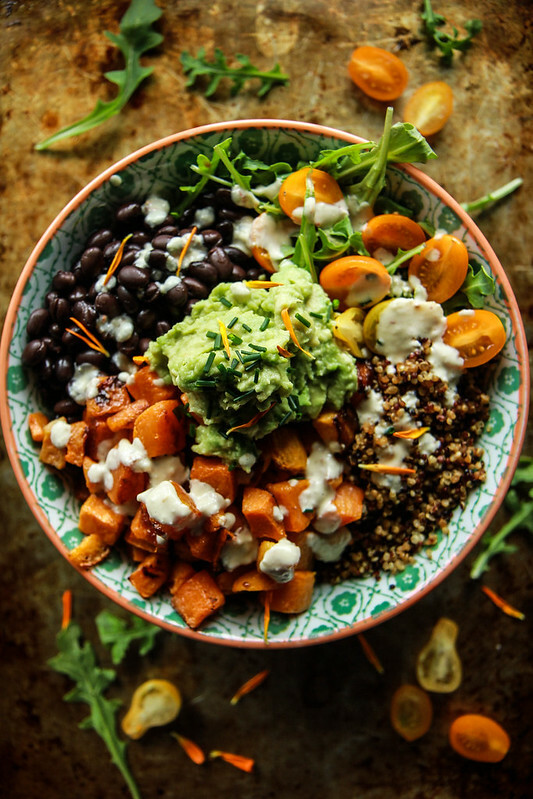 Pingback: Buddha Bowl Craze: Fill Your Body with These Nutrient Foods! I like this recipe! It is very delicious and easy to make. I am gonna make this! It is totally easy Maggie! you will love it! This looks really delicious. It would be helpful to know the amount of servings and the calories per serving. I always appreciate that. Thank you Kate! There are lots of free apps out there that will let you plug in the recipe and get the nutritional info! This looks fantastic and I love the video! Such a great salad for any day of the week! I love that it is loaded with protein and healthy fats! The Spicy Lemon Cashew Dressing looks heavenly. I have so many cashews I have yet to use! Will have to make this ASAP! I can see why it’s a fav! LOVE cuban all things! I have loads of cashew butter on hand. Will that work instead of actual cashews? Has anyone tried? Oh, my! Oh, my! Heather, the words heavenly and absolutely amazing fall short to describe this wonderful combination of textures and flavors. Thank you so much Lourdes! Great recipe, but your times are way off. You can’t cook the quinoa for 20 minutes and let it sit for 15…and have total time at 30. 50 minutes is more accurate. Either would be awesome Kayla! Absolutely LOVED this dish. Best quinoa bowl I have ever made. Thank you for the recipe!!! Such a delicious, nutritious meal with tons of flavour. Love splitting this up for my lunch preps. Thank you! Love the idea and will be a perfect meal for me. Jill I don’t even have ads on my site so I am not sure what you are seeing?